3DS cartridge version reviewed. A 3DS update (included on card) is required before the first play. Alexey Pajitnov's highly influential video game shortened my life by a considerable margin since 1992, when I first played the Game Boy edition. After many sleepless moons, I finally conquered the coveted 'Level 9, High 5' difficulty. To be rewarded with the animated launch of a space shuttle during the credits meant a whole lot back in the day. Flash forward to today, and 'Tetris Ultimate', has appeared on the scene. Why try to release a new, or ultimate version, of 'Tetris'? What could the game possibly have to offer, and how could it be better (which is what the adjective 'ultimate' implies) than its legendary, game changer of a daddy? 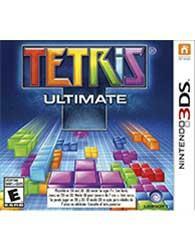 'Tetris Ultimate' sure has big shoes to fill. How do you improve on perfection? Seven simple shapes already proved their worth since 1984, in what is probably the most ported game in the history of electronic entertainment. The landmark 1989 Game Boy version by Bullet-Proof Software remained in my Game Boy long after the portable console has become effectively obsolete and the exact carbon copy for the Virtual Console function on the Nintendo 3DS was, in fact, my first digital purchase for the handheld. Such is the power of the ever-falling blocks, and the never-ending quest to improve on one's high score. How do you improve on perfection, indeed. 'Single Play' houses four modes: 'Marathon' (score as many points as possible and try to clear 15 levels), 'Sprint' (clear 40 lines in the shortest amount of time), 'Endless' (play for as long as humanly doable), 'Ultra' (score the maximum amount of points in 3 minutes), 'Battle' (compete with the very hard TetriBot, who always seems to have more than one edge) and 'Battle Ultimate' (with a lot more power-ups). These latter four can only be unlocked by acing the first two modes. Dying results in a 'saving' and 'saving replay' screen. Saving replay? Will my craptacular playing experience be saved for all eternity, for other gamers to mock me endlessly in a sort of Google-esque cloud cache? Luckily, the option can be turned off. My Mii character is a constant presence during playing, hovering next to the falling blocks as if to keep watch and scold me during failing. Regarding online features, 'Tetris Ultimate' offers 'Quick Play' (to compete with other players around the world, once again split-up in various modes like 'Endless', 'Sprint' etcetera), 'Community Play' (to join or create a community of like-minded players), 'Friends Play' (to join friends in a multiplayer game) and 'Leader Boards' (to see how one compares to other players). Sadly, no one wanted to compete (or no players were online) in time for the review in 'Quick Play', and no communities existed so far. The online experience sounds promising (to a guy in Kentucky, I'm sure to be Mr. Unlucky), but couldn't be sampled. Being a 'Tetris' veteran, I immediately opted for level 15 (this game's equivalent of the original level 9). This took some time adjusting to the new game mechanics. Now, blocks will still float for a few seconds and allow for minor tweaking before landing on their final position. This was only possible on the lower levels in the original game. While frantically pressing buttons to anticipate the next brick, it turned out I was still messing around with the previous one - and thereby screwing up my previous good move. A little annoying, but forgivable. After many years of mastering the monochrome 'Tetris', it takes some time to adapt to the colours - and to place the bricks you thought you knew before. Blind playing is not an option anymore. 'Tetris Ultimate' works like an absolute charm. After hours and hours of play time, 'just one more go' will be the mantra that echoes in your mind. Is it a better version of the prehistoric original? No, but it's a logical evolution. At the end of the day, the core game is still the same. Mum's the word, and don't tell Ubisoft, but this game is actually a lot more fun to play than current, multi-million dollar, triple A-titles. That's the power of 'Tetris'. Thirty years on, and still as addictive as that very first time. Mr. Pajitnov, I salute you! It's 'Tetris'! Graphically speaking, this game could never impress or compete with contemporary cousins. 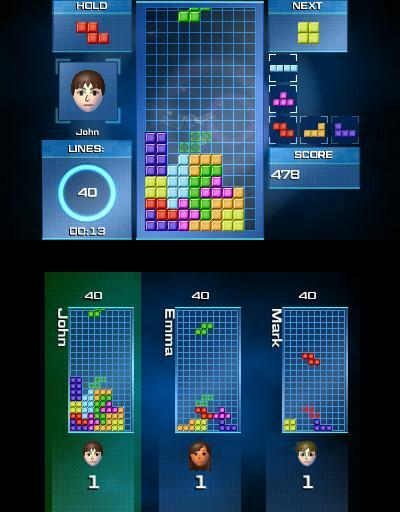 That said, the colourful blocks are accompanied by minor bells and whistles, such as a hint of fireworks when scoring a Tetris (four lines in one go), plus flashes and/or bolts of light when performing a special move. As far as the 3D effect goes, the lever is better left switched off to save on battery life. The blocks have some pop, but nothing truly spectacular. Nintendo 2DS owners can safely purchase this title. Esoteric, arty-farty, mystic, vaguely Eastern-European sound scapes and muzaky lounge tunes are on offer. Give me the classic 'Tetris' theme anytime - one of the most recognizable in video game history, even given a techo remix and placed on a 10" compilation included with an art book on games. After 30 years (a lifetime in the fast evolving timeline of video games), this is still pure heroine. Opium for the masses. Good luck trying to put it down. I once again saw floating 'Tetris' blocks just before falling asleep.